"Oh, Dakuwaqa!" - The Shark comics and cartoons: Nature... not really a quiet zone! Nature... not really a quiet zone! I always thought that my home town was a quiet, peaceful place compared to the city with all the traffic noise and other rackets. You could hear the birds chirping away. Then these birds (cuckoos, I think) starting screeching at 3am and continued screeching all the way until noon. It's as if they think they're roosters or something. They sound like banshees! So, for the sake of sleep, I can only sleep with my windows closed. 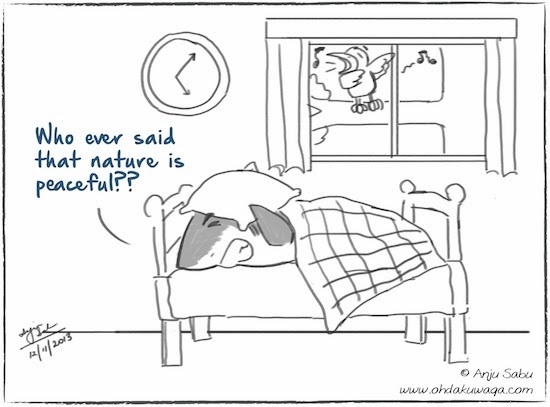 Nature is like an alarm clock you cannot smash into quietness.